1. Orb is the overwhelming choice to win at 4-to-5 in the top spot (odds account for 21% takeout in the exact pool). He's also the most likely second-place finisher with 24.76% of that pool. It's an interesting take because the Derby winner has 72% of the money in the exacta pool but probably won't even have half the place pool. Thus, betting Orb to place is a much better bet than wheeling him up and down in the exacta. 2. No surprise that all other horses besides Orb are more likely to finish second than first. 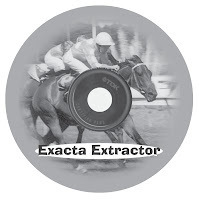 Departing is the second choice to win with his price based on exacta will pays at $11.60. 3. I lumped Goldencents, Itsmyluckyday, Mylute, Oxbow, and Will Take Charge together as co-third choices ($16.40) then made Govenor Charlie the eighth choice ($26.40) and Titletown Five the longest shot ($34.80). 4. The big opinion here is that Departing will be closer in price to the third tier of Derby also rans than to the Derby winner. A chalk-chalk exacta comes back 9-to-1, but Departing on top is a much more robust 21-to-1. 5. Because the biggest jump is from Orb to Departing and not Departing to the next tier, things really blow up if you get Orb out of the exacta. Regardless of your wagering style, it's an interesting phenomena to note because the multis are probably going to be the same way. Whereas at first it appeared that beating Departing might provide some value if you liked Orb, this shows that if you're willing to bet against Orb, don't let Departing beat you. Thx ED for article . I found it better than DRF articles because i am confused what to play. ORB will win that looks to be certanity but you never know in horse racing anything can happen. We can easily rule out couple of horses and those are Golden cents , TT5 from exacta.